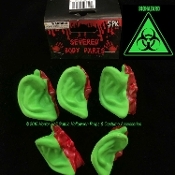 5-GREEN Life Size Human EARS Cut-off parts from the Zombie apocalypse! Almost like the one at your local Grocery Store... Ghoulish Green with Splatters of RED painted Blood! Detailed in Biohazard Exposed Green Color. These 3-Dimensional RUBBERY PLASTIC Squishy Ears will no longer wiggle!